For the ultimate personal exploration of the beautiful southern Broads, hire a self-drive day cruiser. 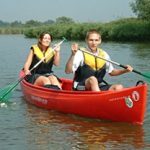 Hiring a boat is the best way to explore our unique landscape and you can take your time to enjoy the peace, tranquillity and endlessly changing wildlife of the river Waveney. Alternatively, if you’re looking for something a little more up-close and personal, check out our selection of single and double-seater kayaks, or the bigger Canadian Canoe for three adventurers. There is no better way to experience our quiet, natural waterways. All boats, kayaks and canoes are available for the day or half-day. Try our stable, easy-to-paddle, lightweight kayaks – brilliant fun, manoeuvrable and quick. The fastest growing water-activity – easy to do & great fun. Ideal for beginners, and if you do fall off it’s easy to get back on without having to empty the water! Try one of our Mad River or Old Town Canadian style canoes – flat bottomed so hard to tip over and great fun for the family. The fastest growing water-activity – easy to do & great fun. Ideal for beginners, and if you do fall off it’s easy to get back on without having to empty the water! You can get 2 adults or children on this baby. At 21ft this makes an ideal picnic boat with a toilet, wash basin and hob on board. Our luxury 25′ sporty-looking cruiser, built by our own craftsmen at Waveney River Centre and featuring aft cockpit with removable suntop canopy and cabin, galley & WC forward. A 24ft single level cruiser with sliding canopy, WC and galley. Perfect whatever the weather as the roof can be independently opened on either side. Picnic sets are available, please request on booking. Spacious aft cabin cruiser with 1 double cabin and two settees which convert to single berths in the saloon. A great family boat with plenty of room inside and out. Versatile sleeping options are available on board with 1 double cabin, 1 cabin which has a choice of a twin or a double and a settee which converts to a double berth in the saloon. A great pet-friendly family boat with plenty of room inside and out.